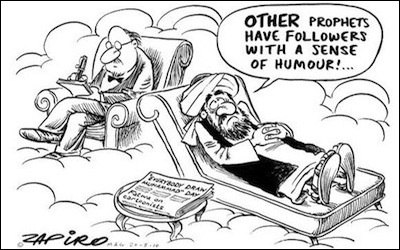 Why Can't Muslims Laugh at Mohammed? In Mel Brooks' comedy History of the World Part I, Moses is shown descending from Mount Sinai with three stone tablets in hand. As he declares, "I give you the Fifteen Commandments," one falls and breaks, and Moses corrects himself, "er, Ten Commandments." Jews, including the observant, find this funny rather than offensive. As we learned once again in Garland, Texas, Muslims do not laugh at jokes about Mohammed, the purported author of the Koran (as Moses is the author of the Torah). Two wannabe Jihadists with assault rifles and body armor were no match for an off-duty Texas traffic cop with a sidearm, but the incident might have turned into a massacre worse than the murder of the Charlie Hebdo staff in January. Why do Jews as well as Christians–but not Muslims–laugh at jokes about the founders of their faiths? The answer is that radically different deities are in question. Judaism begins with a covenant between God and human beings–Abraham and his descendants–that is a partnership in which God is normally, but not always, the senior partner. As Rabbi Lord Jonathan Sacks observes, the Jewish sages of antiquity envisioned Moses acting as a judge for God, permitting God to annul his earlier vow to destroy the Jewish people after the sin of the Golden Calf. This is unimaginable in Islam, just as unimaginable as the Christian God who humbles himself on the cross. Humor arises from the impossible tension between an infinite God and finite man. That does not diminish the sanctity of holy writ: if a Torah scroll is dropped accidentally during Jewish services, Jewish law binds the congregation to a month of fasting. But the Jewish (and hence also the Christian) God allows his children to give him an argument, as Abraham does in the matter of Sodom and Gomorrah, and Moses does on several occasions. Humor arises from the impossible tension between an infinite God and finite man. "Humor is intrinsic to Christianity," wrote the great Danish theologian Soren Kierkegaard, "because truth is hidden in mystery." Jewish and Christian scriptures are human reports of an encounter with the Divine. The foundation of the Christian Bible consists of four separate reports of the ministry of Jesus of Nazareth that in some respects contradict each other. The Koran, to be sure, has contradictory elements, which are addressed through so-called Abrogation Theory (Naskh), allowing one Koranic verse to be nullified by another. But Mohammed's revelation of the Koran is not a human report so much as a stenographic transcription of the purported words of Allah. No Muslim argues that Mohammed was more than human, but for practical purposes he is indistinguishable from Allah, because he was simply the vessel into which Allah supposedly placed his directions. To make light of Mohammed is to impugn Allah. It is not blasphemous to laugh at Moses, whose human failings prevented him from leading the people of Israel into the promised land. To humanize Mohammed, though, is an act of lèse-majesté against the Muslim God. That is not quite the same thing as joking about Moses or St. Matthew. Personally, I find most convincing the argument by the German convert to Islam, Prof. Muhammed Sven Kalisch, that the Prophet Mohammed did not exist in the first place–at least not a man who in any way resembles the figure portrayed in the standard Muslim account. That is in some ways beside the point: there is no divine-human encounter in Islam, no revelation, only the selection of a human mouth as the loudspeaker by which Allah declares his Koran. Allah could as well have employed a talking rock. The Muslim god therefore remains utterly remote from humans, unconstrained in power and arbitrary in his actions. It is Allah's caprice that electrons spin around an atom's nucleus, or that planets describe an ellipsis around the sun. As Franz Rosenzweig observed, the actions of God are indistinguishable from naive observation of the natural world. They simply are the way things are, and for no other reason than it is Allah's whim that they be that way. An atheist who believes that the world is utterly chaotic and random will see the world in precisely the same way, with one grand difference: the way things are, to Muslims, includes the sedimentary layers of centuries of tribal practice: wife-beating, slavery, punishment by amputation, female genital mutilation (depending on the tribal history), and so forth. To slight Mohammed, and by extension Allah, means the ruin of the way things are, the dissolution of the ties that hold society together. To question the way things are is to inspire social chaos. That is why most Muslims in the most populous Muslim countries (with the notable exceptions of Indonesia and once-secular Turkey) believe that apostasy should be punished by death. It is also why the moment that the literacy rate in Muslim countries reaches the 80% mark, the proportion of people claiming to be non-religious jumps. Iran, the first Muslim country to approach universal adult literacy, is by far the least religious, despite its theocratic regime. When the regime falls, as it eventually must, we will discover that there are no more Muslims in Iran than there were Communists in the Soviet Union. Iran's mosque attendance rate is the lowest in the Muslim world at less than 30% by one estimate, and much lower by other estimates. To question the way things are is blasphemy in Islam. Religious observance in Iran collapsed in tandem with the country's fertility rate (down from 7 children per female in 1979 to just 1.6 in 2012), a gauge of how rapidly traditional society has dissolved. The organizers of the Garland, Texas exhibition of Mohammed caricatures–the Dutch politician Geert Wilders and the anti-jihad campaigners Pamela Geller and Robert Spencer–have proven their point: To placate Muslims in their resistance to modernity would require the West to give up being the West. Today's resurgence of Muslim fundamentalism is something of a Ghost Dance, a grand flourish of existential despair before the way things are turns into the way things were, and never will be again.